REDSTONE ARSENAL, Ala. -- Construction is in full swing on the Goss Road realignment near Gate 9. The new road, which will parallel Rideout Road and connect into Rideout at the existing U-turn south of Gate 9, is being constructed to address security and safety issues, and also open development of the secure area of the Redstone Gateway enhanced use lease project. "This project, which is part of the Redstone Arsenal master plan, will alleviate a security issue where Goss Road currently connects to Rideout, and solve safety issues related to the proximity of Goss Road to the I-565 interchange,"Joe Davis, director of public works for the Garrison, said. "But the realignment also allows for EUL growth, followed by relocating the Gate 9 security access point further south on Rideout Road and continuing growth in the EUL secure area." Currently, there is a security issue with the exit lane of Goss Road north of the Gate 9 security access point, Davis said. There is also a safety issue with vehicles exiting the Arsenal on Goss Road and vehicles using the existing U-turn to gain Arsenal access to Goss Road, he said. The project is being funded with $1.2 million in City of Huntsville road funds. It includes one mile of a two-lane road traveling from the western edge of Goss Road, and then curving south to continue between Rideout Road and the Links golf course. The realignment will connect to Rideout Road with a traffic signal, with a de-acceleration lane south of the traffic signal exiting Rideout Road onto Goss Road and an acceleration lane north of the traffic signal existing Goss Road onto Rideout Road. The left turn lane on the southbound lanes of Rideout Road that is now used for the U-turn will be expanded and used as a left turn lane onto Goss Road. There will be a 4-foot paved shoulder on both sides of the Goss Road realignment. Construction on the realignment began the week of April 21 with the stripping of top soil, Lee Riddle of the Directorate of Public Works' Engineering Division said. "But preliminary work on the project began several weeks ago, with setting up a traffic control plan, engineering the layout, surveying the center line of the roadway and pinpointing drainage structures," he said. "There will also be a substantial amount of gas lines running along Rideout Road that will require relocation." The signalized intersection will allow for safe access to Goss Road and the western end of Redstone Arsenal. The traffic light will be programmed to stop traffic only when vehicles need to turn left onto Rideout Road from Goss Road and when vehicles need to turn left from Rideout Road onto Goss Road. The traffic light should have minimal impact on the morning's incoming traffic and the afternoon's outgoing traffic, Riddle said. Plans call for "a fairly aggressive schedule" with completion of the expansion by the end of the year, Riddle said. Once the expansion is opened, the current Goss Road exit north of Gate 9 will be closed. 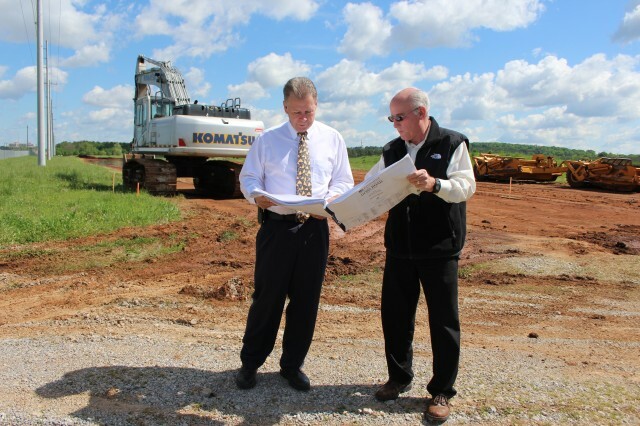 The Garrison's Directorate of Public Works is working with the City of Huntsville on the project with approval of the Department of the Army and the Federal Building Authority. LBYD Civil and Structural Engineers did the realignment's engineering work and Reed Contracting Services is the contractor. Riddle said there will be minimal impact on Rideout Road traffic during the realignment's construction, with impact occurring primarily when the Rideout Road acceleration and de-acceleration lanes are being constructed.